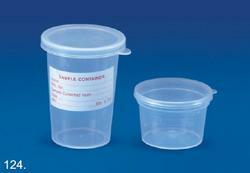 Made of polypropylene, these disposable containers are used for collecting samples of sputum or urine etc. Graduated on the outer surface, these containers have cap that work in a press & fit manner & make these containers leakproof. These disposable containers are e. T. O. Sterilized. We are one of the renowned and well-known industries which are extensively engaged in providing several kinds of supreme quality Carriers and Discard Containers in the market. These products are manufactured using quality tested raw materials. We are leading exporter, wholesaler, trader, importer and supplier of Universal Container. We supply container according to the client necessities. container provided by us meet different business sector guidelines. We are a Manufacturer and Supplier of Platinum Containers. Our Platinum Containers can be efficiently function for the growth of Crystal Oxides for magnetic and optical purposes in particular industries. These Platinum Containers are manufactured with advanced technology and are stringently tested for high performance. Capacity: 25 ml. & 50 ml. - Size as per WHO STOP TB Guidelines. - Leak proof with screw-cap. - Capacity 40 ml with mid marking at 20 ml. - Aesthetically designed slight conical shape for less space usage. In addition to the range of existing sample containers, this Stool Container has the unique feature of one piece molded cap-spoon combination. 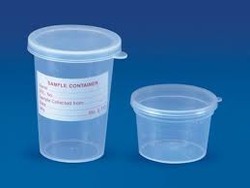 Made for polypropylene, these disposable containers are used for collecting samples of sputum ou urine etc. Graduated on the outer surface, these containers have cap that works in a press & fit manner & make these containers leak proof. These disposable containers are E.T.O. sterilized. Three different sizes of container are available, 70, 120 and 200cc. They are made from styrol, which is strong, light in weight and as transparent as glass. Euro Design Beakers, moulded in polypropylene, have excellent clarity and very good chemical resistance. These autoclavable Beakers have prominently raised graduations on the outer surface. Pouring a Solution becomes very convenient because of its tapered spout.